A “RENEGADE” & THE “FUNNY PEOPLE ” ! The visit of the President of the United States (POTUS) is an event to remember. But, when Barack Obama decided to visit India for the Republic Day Celebrations it triggered unprecedented excitement as after all he was going to be the first ever US President to visit India twice and the first ever to be the Chief Guest at the R Day Parade. To begin with, the visit offered 24 hour news (gossip?) channels an opportunity to shift focus from “really grave” issues such as the survival prospects of a live fish stuck in a boy’s wind pipe. Having long mastered the art of saying the same things in many ways – What will Obama do in India? Will Obama do anything? Has Obama done anything ever? – “in depth” expert analysis was provided. Nothing was too banal or sacred and Obama’s stomach ailment was explored ad nauseum and almost the entire nation was now an expert in the diagnosis and treatment of “acid reflux” – which was going to deprive the POTUS of the sumptuous and spicy Indian cuisine. Acid reflux?Its our very own “khatti dakaar” ! 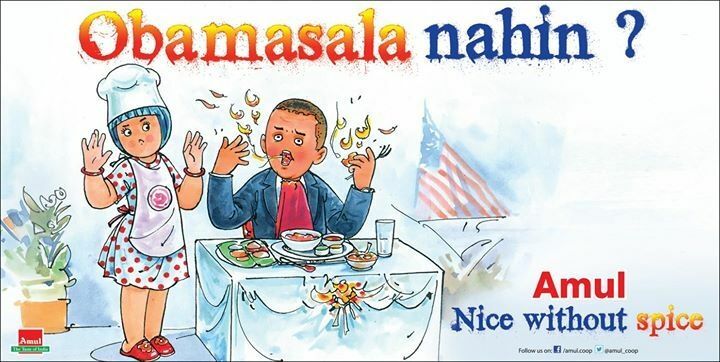 An earlier Amul ad covered this incident when Obama’s personal physican diagnosed him with “acid reflux”.The Tag Line ..Obamasala Nahin…is a play on the name Obama and the hindi word for spices –“masala”- and translates into no spices for Obama. 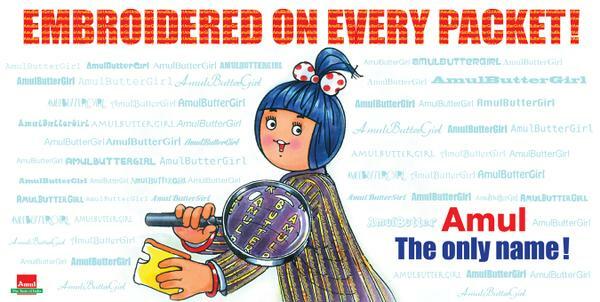 While the Punch Line…No Spices Here……endorses the taste and virtues of Amul butter. Obama’s US codename “Renegade” was known to all and his seven layered security was reported upon in so much detail that even the US Secret Service learnt about its own capabilities watching these Indian channels. Also, ISIS got to know enough to threaten POTUS with beheading inside the White House itself! But some like the Delhi Police weren’t amused on being the outermost layer in their own lair (the farther the better?)!!!! American “super dogs” were the toast of all channels. Their reported abilities and traits caused de-recognition of “desi” dogs as dogs itself. One guest on a show was at a loss of words when asked why Indian dogs in the forces did not have an officer status akin to their American counterparts. The reporter though tried to suggest that American dogs were smarter as they were thinking in English (Bihar Police dogs would be be gung ho in Bhojpuri?) ! Obama’s USD 1.5 million armour plated Presidential car –the Beast – mesmerized us Indians who are even deprived of wipers (Tata Nano) and other basic safety measures in cars.To ameliorate the situation “manufacturing” hubs in Punjab announced that one can get even his Maruti 800 converted into “the Beast” for a pittance and choose any colour as well. Fluorescent Green with MSG logo is a rage! In the midst of all this the Americans rapped the Pakistanis on the knuckles over ensuring zero terror strike during the visit or be prepared to face the consequences. This left the neighbours red faced and obviously warmed the cockles of all and sundry in India. Just before the visit was too happen Obama cancelled the Taj Mahal due to the sudden demise of King Abdullah of Saudi Arabia. This was a dampener of sorts but for some it was good news as they could now merrily spit and deface the monument once again. An Amul ad had highlighted this issue previously in 2014. PM Narendra Modi broke protocol and received Obama and the First Lady at the airport.From then on, for the next three days, it was the personal chemistry between the two that drove the agenda. Visuals of the ingenuous “chai pe charcha” (talks over tea) at Hyderabad House between Obama and Modi were beamed the world over and it was a unique one- on- one, in full public view but in private too. The body language and the personal rapport were indicative of a level of comfort unseen between US Presidents and Indian PMs. This Amul ad on Obama’s visit shows two caricatures depicting him and Modi respectively in the lawns of the Hyderabad House in the same setting as it was during the “chai pe charcha”. The Amul girl has been shown as serving the butter laden toasts being savoured by the two leaders. The Tag Line..Buddy buddy baatein?.. is a play on the word “buddy” showcasing the bonhomie between the two leaders and the hindi word “badi” meaning big, which illustrates the fact that it was during these talks that perhaps the two leaders laid the foundations for the big breakthroughs achieved during the visit. The Punch Line….. Bread Butter Bromance. Simply endorses the Amul Butter and the “brotherly” bonhomie between the two leaders. Obama attended all the functions with a sense of purpose and commitment. He broke protocol during the R Day Parade by attending for two hours instead of the security stipulated 45 minutes. He also made it a point to break into Hindi, whenever he could.Obama’s speech at Siri Fort Auditorium was replete with examples of Indian icons such as Mahatama Gandhi, Swami Vivekanand, Milkha Singh,Kailash Sayarthi,Mary Kom and Shah Rukh Khan.Infact Obama’s attempt at a Bollywood dialogue…”Senorita ..bade bade deshon mein… “ struck a chord and further showcased his intent and positivity towards India and the relations between the two countries.The joint hosting of the popular radio chat “Mann Ki Baat” by Modi and Obama further underscored their personal rapport and was a unique way of demonstrating the growing bonding to a larger audience. Much of the credit for this rapport goes to the highly successful US visit of Modi, He and Obama bonded based on their humble beginnings and have since carried it forward. The two have demonstrated tremendous statesmanship in taking bilateral relations forward. It’s quite a feat for a second term President, who is considered a “lame duck” to risk his political legacy for India ,whose citizen were once referred to as the “funny people” by Eisoenhower. This is especially remarkabke for a US President who has lost control of both houses of the senate after the recent midterm elections. 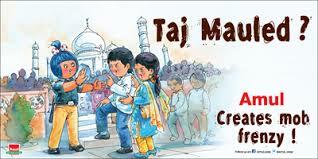 An Amul ad on the US mid term elections to the senate covered this development in the US political sphere. The delegation level bilateral discussions fed on the rapport between Modi and Obama and major breakthroughs were achieved in the fields of civilian nuclear cooperation, India’s quest for a permanent seat on the UNSC, defence cooperation and bilateral trade. If India will benefit so will the US. India will bolster the US’s case in the international strategic sphere and is also a major economic market for the US to tap. It has taken 70 years for the world’s leading democracies to draw closer. As one commentator has aptly put “it’s the dance of the stars” that are finally fortuitously placed to allow Indo-US ties to come out of the shadows of the past. A shared China centric view, common threats in the form of global terrorism and India’s rise and potential as an economic power are the three pillars of this transforming relationship. Pakistan and China added to the fun by behaving like a jealous couple. Pakistan sulked at being passed over by the US for arch enemy India .And China uncharacteristically betrayed its anxiety at the sudden warmth between India and the US. In the final analysis India should remember that the US always keeps its national interests foremost and so she should never be blindsided by any personal charisma or rapport or strategic promise, but maintain a pragmatic course.It was an immensely successful visit by the POTUS and the results will definitely emerge in time. Overall the visit was an emphatic success and tremendously choreographed.The first ever Guard of Honour by a woman officer,Wing Commander Pooja Thakur, and the first ever all women’s contingents of three services were a special legacy of the 66th Republic Day celebrations that even the Obamas will remember. To round up the zany side. The media focused so intensely on the numerous hugs between the two leaders that at a point it seemed as if it was dying to identify if they weren’t “straight” !For their part the two couldn’t really keep their hands off each other either!!! Then someone remarked how Modi upstaged Michelle Obama’s fashion tastes (???)! Mrs Obama versus Mrs Li Xinping is fine but Modi versus Michelle???? Well, this happened because NaMo consistently wore some “cool” and chic kurta’s and bandhgala suits.One which caught the eye the most had his name embroidered in vertical stripes.So much so that the observers felt he had upstaged the first lady of fashion in the world ! Amul caught on the idea and made use of the same in this well timed ad on the personalised monogrammed suits wirh the Amul girl showing off the company branding in the same style as Narendra Damodardas Modi was embroidered on the PM’s suit designed by Bipin Chauhan. Though Amul found enough in the visit to take out four topicals, sadly it missed out one on the 66th Republic Day itself especially with its numerous and unique firsts. Lastly…The master stroke almost got missed out.PM Modi invited Obama and the American’s took over the security and thus Modi’s first R Day went incident free.Smart boy.For the next one lets call ISIS Chief Baghdadi.What say ? Other than the nuclear deal it’s only the personalised monogrammed suit of Narendra Modi which has managed to retain its sheen from the not so recently ” concluded Obama visit. The suit was associated it controversy when Modi’s opponents used it to attack his pro poor credentials.In fact the suit was seen as a factor, during the Delhi Assembly elections, in swaying voters towards the Aam Aadmi Party as it made Modi seem elitist and far removed from the underprivileged sections of the society. However there was a clever twist in the tale when Prime Minister Narendra Modi decided to auction the gifts received by him for garnering funds for the Clean Ganga Campaign.The Surat Municipal Corporation was entrusted with the responsibility. The auction evoked derision,criticism as well as support but most of all keen interest and even keener bidding.bidding . For a total of 460 items the bid amount collected was a whopping Rs 8.33 crores with the replicas of the Statue of Liberty and the Pashupati Nath temple drawing bids of Rs 1.11 crores. But the star attraction was “the suit” which drew 47 bids and was sold for a whopping Rs 4.31 crores. The bidding had stabilised at 1.48 crores on the second day of the auction but on the third day it sky rocketed to the final amount.The successful bid was made by Dharmandan Diamonds’ Hitesh Patel .The prized item is now gracing the reception of the diamond firm. This Amul advertisement on the auction of Modi’s suit shows the Amul Girl looking at a display of the famous attire with a Narendra Modi mannequin donning it.A photo depicting the moment Modi wore the suit while receiving Obama completes the background to the suit and it’s claim to fame. 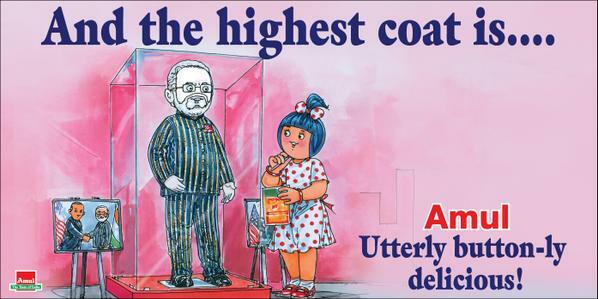 The Tag Line …And the highest coat is… a take on the high bids drawn by “the suit”. 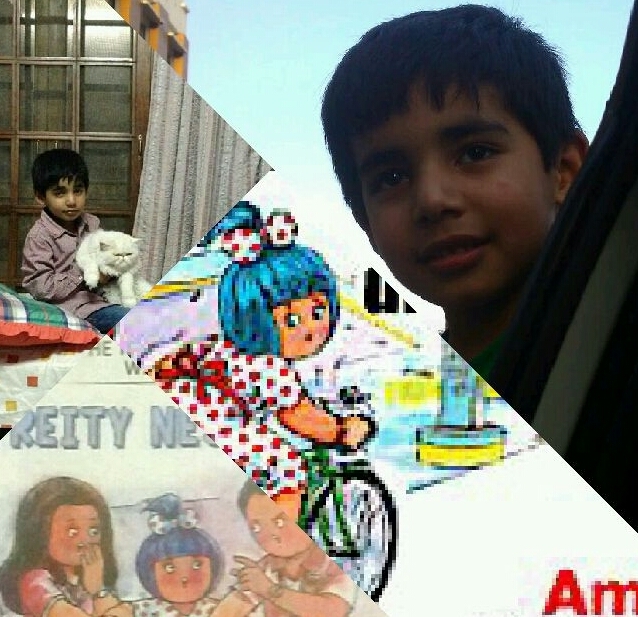 The Punch Line …Utterly Button-ly Delicious… is a play on the famous Amul ad line. The high bids and the cause for which the auction was held may help in blunting the damage that the suit had caused to Modi’s image but in a sense it was good fun too as never had a dress made it to the headlines in such an emphatic manner. I for one am eagerly awaiting the China visit ! Previous PostIPL SPOT FIXING SAGA: INDIAN CRICKET’S “WATERGATE” MOMENT !Next PostFIGHTING TERROR IN THE TIME OF NAYSAYERS ! Whatever anyone says- Modi does know how to do things differently and get away with all the limelight.Hoping he demonstrates the same attributes in making a difference in the country too. good piece (I mean the article and not Modi’s designer suit), nicely articulated. He has positioned himself as a dream merchant and now needs to deliver over the next 2 to 3 years.It just might be the boom decade that India has been waiting for. Obama’s cozy vacation in India..
Hope the visit delivers on half the agreements that were trumpeted about,then all of it will perhaps be worth the effort. Good one. Great humour. Makes an interesting read. There’s a new style icon born. Prada and Gucci beware! If someone were to ask Modi…. Do you have it in you….my answer on his behalf would be yes… Modi has it in him. No one should grudge him his style.Even Mahatma Gandhi had one though spartan in comparison.A leader needs to demonstrate poise and a persona which has some ounces of charisma thrown in for good measure.So it’s all right if has a style to write home about. But as has been said often,he has to deliver and then this very style will be become an asset and not an unquestioned trait in the mould of Nehru and Indira. All this razmatazz will make sense once we see some serious work happening …. As of now Mr Modi seems to be fulfilling a lot of his personal. held deep within desires … To travel rhe world for starters 😃😃 I m so sure his whirlwind world tour post coming into office was partly improving international relations but majorly to satiate his ‘keeda’ for traveling 😋 second the suit with his name printed in stripes ….. Thats not as much his fashion sense as it is his love for power and authority and again a hidden fantasy, somewhere lack of humility and also narcissism …… A set of traits displayed by dictators across centuries….. And it’s amazing how this is just taken as a passé. I won’t be surprised if he wears custom made underwears with his name written across it ……. Pappu has taken a swipe at the suits too.But then theres nothing really against Modi as of now.After the moribund years of lethargic activity of the UPA years , Modi’s travel routine may seem a little awkward for its sheer regularity, but then if things have to change the global outlook too has to change regarding India being an investment worthy destination.Without a robust economy no development agenda can be sustained beyond the realms of rhetoric.In that sense an energetic foreign policy is a welcome change and has’nt been seen since the days of Rajiv Gandhi. The Obama visit is an extension of the same philosophy which seems to be the cornerstone of the Modi governments vision for India. And personalised clothing is certainly a first for us Indians who are used to dreary safari suits and unimaginative attire from our PMs and Presidents.Atleast theres a nit of a respite from the mundane. Very riightly pointed out that the visit was replete with well thought out actions.It was one of the most well choreographed visits in a long long time.It had the right visuals and the right emphasis on getting tangible results during the bilateral talks and otherwise. His emphasis on developing personal equations is welcome too.As this sometimes moves those levers of power seem stuck in history or bureaucratc complexities. But the tangibles have to start materialising.From the poor to the middle classes the result of this approach are awaited.Two years from now we shall be able to revisit this page with more concrete arguments for or against the stated approach. But in all fairness the hype and the buildup by our 24hour news channels provided enough ideas.And the best comedy was actually being played put on Pakistani TV channels. The Chinese reactions were very succinct and accurate and though they may seem like a jealousy pang but in actuality were very considered thoughts.The Chinese are worried and they let that out too. PAPPU embroidried shirts are in fashion…. The country wants to know…..why the designer shirt…. or the Sansani guy with the pony tail shouting in his gruffy voice….Michelle Obama ke pyaar mein kisne apna naam shirt pe gudwaa diya…kaun hai yeh sakshh…..
You missed out on MONKEY BAAT….as suposedly reported in US press…. but a real good hocus pocus of the POTUS and NAMO……..
Pony tailed “sansani” guy with his Michelle Obama allegations !!! !Thats the one i missed and i assure he is making an entry in my next piece.Of course due credits to you. And “monkey bath” was a bit of a hearsay so i skipped it. Thanks for the time and the thumbs up ! As a reigning politician, Narendra Modi cuts a lonely figure on the world’s auction dais, but he can count on an iconic blonde for company. Never mind the highest bid so far for his “selfie suit” isn’t a patch on the most expensive garment ever to be auctioned – the dress that Monroe wore in the 1955 film The Seven Year Itch and which went under the hammer for $4.6m in 2011, 49 years after her death. According to current exchange rates, that would be over Rs 28 crore. In recent memory, only three pieces of clothing that politicians have worn have been sold through auction. But they belonged to persons who are no more. A top hat worn by Franklin D. Roosevelt in his first presidential inauguration in 1933 sold for $46,875 (around Rs 30 lakh now) in September 2014. The Air Force One leather bomber jacket John F. Kennedy wore sold for $5.7 lakh (around Rs 3.54 crore) last year. Along with the jacket, a tie worn by Kennedy, who was assassinated in 1963, went under the hammer for Rs $8,710 (Rs 5.41 lakh). Modi’s suit is perhaps the first garment worn by a world leader to have been put up for public auction in his own lifetime. Bipin Chauhan, Modi’s stylist and one half of Jade Blue, the menswear brand that produces all of Modi’s clothes, isn’t complaining. “I have never heard a garment of a (living) politician being auctioned,” Chauhan said.